Anjan Sundaram’s new book, Bad News: Last Journalists in a Dictatorship, takes aim at the vaunted position Rwanda enjoys in the western imagination. Far from being a success story of post-conflict peacebuilding since the 1994 genocide, Sundaram’s Rwanda exists in an authoritarian bubble characterized by fear and repression. Over the course of nearly five years living in the country, Sundaram witnessed the steady dismantling of Rwanda’s press corps and the stifling of free speech more broadly. In order to survive, some of Sundaram’s students, colleagues and friends reinvented themselves as regime propagandists, while others went into hiding or fled the country entirely. By silencing and co-opting the press, Sundaram argues, the government has largely succeeded in destroying the possibilities for independent journalism in Rwanda. I recently spoke with Sundaram about Bad News, the nature of political repression in Rwanda, and his experience working with journalists in a place where even mild criticism of the government can cost one their life. What brought you to Rwanda? Did you know what you were getting yourself into when you decided to relocate there? I went to Rwanda in 2009. At the time, I was looking for a quiet place to write my first book, Stringer about the Democratic Republic of Congo. Rwanda seemed like a quiet, calm country; peaceful, maybe even a little bit boring. Rwanda also happens to share a border with Congo, and so I thought that in the event that I needed some inspiration while writing Stringer I could jump across the border. What I knew about Rwanda was what you’ll continue to find in the press today – that it is a harmonious country that is recovering from the genocide and making great progress. But I was also offered a job teaching and working with Rwandan journalists in a program funded by the European Union and the United Kingdom. I thought that this would be a great way to engage with society, working alongside my journalist colleagues in the country. What I quickly realized was that they were operating in an incredibly repressive environment. One journalist told me about how he had been beaten into a coma after he brought up the issue of press harassment in front of President Paul Kagame at a press conference. Another student, who was sick with HIV, told me about how during imprisonment she was dragged from room to room, not allowed to sleep, driven to exhaustion, and how her child was effectively orphaned during this time. These journalists were special. They were some of the last independent journalists left in the country. The Rwanda you describe is almost totalitarian in nature. I didn’t write this book from the perch of free speech evangelism. I focused on journalism in the book because I wanted to explore the consequences of a collapse of the free press. What happens to society? As I write in the book, “a society that cannot speak is like a body that cannot feel pain.” A crucial feedback mechanism is lost, and the government becomes capable – whether voluntary or involuntary – of incredible harm. What is troubling about Rwanda is that the entire country is controlled at a very minute level. The country is divided into villages, each village has between one hundred and 150 families, each with a chief and an informer. Orders passed from the central government down to the villages travel very efficiently. It was this same structure that was used to execute the genocide in 1994, and was one of the reasons for the genocide’s speed and efficiency. As soon as the order was issued in Kigali, the killing commenced nearly simultaneously across the country. People went out to kill after orders were made by the local cells. That structure is still in place today, and President Kagame uses it to pursue a variety of ends. He decides, for example, that plastic bags are bad for the environment. And so almost overnight, plastic bags basically disappeared from the country. Rubber slippers should be worn by everyone, he decides. Again, rubber slippers appear on people’s feet almost overnight. And during elections, Kagame orders that everyone get out and vote, leading to participation rates in Rwanda of 95 percent, whereas in other countries you’d get closer to 30 percent. The power of this system is extraordinary. Because it was used during the genocide, many Rwandans I know are incredibly worried about how it might be used in a country increasingly totalitarian, in which there are no alternatives to Kagame’s power, and in which society hears only one voice – that of the government. There’s a moment in the book where one of the Rwandan journalists cautions you not to think so much about what you see, but instead to look for the things you don’t. And it seems to me that this idea echoes in the way in which journalists look to get around the government in their reporting on the country. Can you talk about how some journalists have gone about doing this, to the extent they’re able to? That’s a great question. The thing about dictatorships in general – and Rwanda is an example of a modern-day dictatorship – is that the world has moved well beyond Cold War stereotypes, with a few exceptions like North Korea. In a modern dictatorship, spies in trench coats don’t follow you on the streets, the phone lines don’t crackle. What you have instead is something much more sophisticated. Politicians wear Western suits and announce that their country is open for business. You have multi-party elections. It’s a very different facade. In order to understand modern tyranny, then, you have to learn to listen and see quite differently. The example you referred to came from one of my students, Gibson, who taught me how to look, to see not what the government shows you, but what it hides. To your question about how the media work around the government, there are several examples of this, but they occurred more frequently in the past than they do now. Gibson, for instance, wrote a story about malnutrition. The government narrative boasted that hunger had been banished from Rwanda, and that food production was at an all-time high. But malnutrition is a significant problem. Unfortunately, journalists could not write about this topic without official sanction. So Gibson tried to perform his role as a journalist by publishing information that would help parents feed their children better without stating overtly that there was a malnutrition problem. There are other examples, as well. There was a paper called The Chronicles which has since been shut down. It was published in English – the language of the elites – and so most Rwandans couldn’t read it. The conversation was therefore limited almost exclusively to Rwanda’s elites. Because the paper had no widespread readership, it posed almost no threat to the government. One of The Chronicles’ front-page headlines asked “What is Paul Kagame’s salary?” The story actually had no news content. It turns out Kagame’s salary, officially, is in the median of most heads of state. But the fact that the paper’s editor was willing to ask the question was news. It was a benign question on its face, but in Rwanda it was understood as breaking a taboo. But then the editor went in even further. In 2010, Paul Kagame said he would not run for a third term in power, and promised to respect the constitution that limits presidents to two terms. This editor suggested that Rwandans should take Kagame at his word, and argued that society should spend time thinking carefully about what sort of leader the country needed, what sort of leader should follow after Kagame. He actually went around interviewing the leading lights of Rwanda – politicians, intellectuals, and the like – about where the country was headed, where it should head. Very soon after, the paper was shut down. It was harbinger of what was to come. Just recently, Kagame announced that he would break his previous promise to respect the two-term constitution and will run for a third term as president. The constitution has been changed to allow him to remain in the presidency until 2034, potentially. More generally, there are other ways in which people try to get around the government. I met one man in a village who appeared to be insane, but later pulled me aside and told me he had things to tell me in private about what was happening in the village. In public his persona was one of madness, and so people dismissed him, which gave him a kind of permission to say things that ordinary people might not. There’s a kind of sad irony in that, in the sense that those who speak truth to power in Rwanda are sometimes, as you describe in the book, driven to insanity by government repression. But you also discuss the ways in which living in Rwanda disoriented your own sense of reality, and took a psychological toll on you while you were there. Can you talk about this a bit more? Rwanda is a very easy place to live in on the surface. It’s clean, it’s orderly. Officials obey orders. But once you get beneath the surface – and I did through my work with Rwandan journalists – it became a difficult, almost impossible place to live in. For example, one night I heard an explosion. I raced out to the site, but was told that nothing had happened by officials. Some of my colleagues confirmed that they too had gone to the site and had attempted to take photographs. But the officials denied that anything of the sort had happened. And over time, if you cannot get confirmation from the outside world of the things you hear, in this case, you begin to doubt that you had heard what you thought you had heard. This is extremely disconcerting. I related in the book an instance where a colleague took me out to the countryside where many people were homeless. We weren’t sure why the people were homeless or that they were homeless at all—it wasn’t reported by the press. I was shocked to see thousands of people living out in the open, in some cases quite sick. It was rainy season, so some were suffering with pneumonia or malaria, the elderly and children were dying. Some people lived in the few cement homes in the villages, stuffed into tiny rooms with goats and pigs for want of space. All of the huts that had previously housed these people were disassembled. Thatch lay on the ground. It could have been put back on roofs, and yet the people didn’t do it. There was no sign of aggression, no signs of violence. I was stunned by what I saw. When I asked one of the villages who had done this to them, who made them homeless, he said, “We did.” As it turned out, President Kagame had decided that grass roof huts were primitive, and local officials – desperate to please him – had gone out to the villages to get them to tear them all down. Remember, civil society was broken, no journalists were going to report this. The villagers tore down their own huts, and then asked: now what? And the officials told them that they had to wait for further instructions. I saw in front of my own eyes the harm a society can inflect on itself when it can’t speak. There had been these moments before – most famously the genocide – when society did itself harm under direct government orders. And large numbers of people complied. To live in a society where such massive betrayal of the self was happening so often became increasingly disturbing and distressing for me. It isn’t just people that get broken down, including those reporters that are coerced into following the government line. As you describe in the book, foreign governments and humanitarian agencies – who know better – are also going along with the program. Why? Any foreign correspondent worth his or her salt will tell you that their reporting in a country is only as good as the local journalists they’re partnering with. This is especially true today as foreign correspondents often parachute in, spend – if they are lucky – about a week in that place and have to produce a seemingly authoritative report. 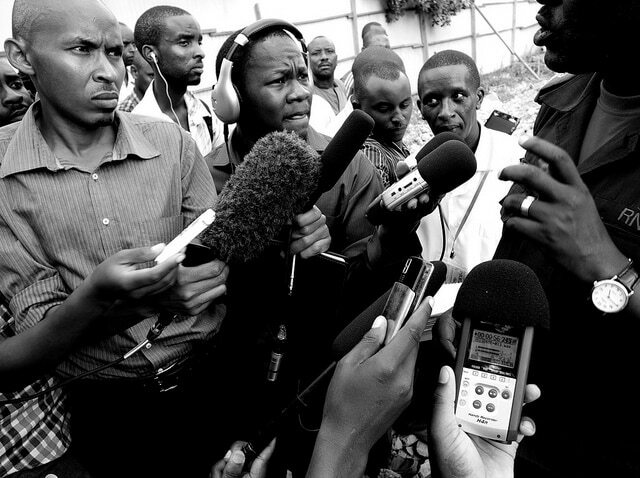 What’s happened in Rwanda is, with local press destroyed, the link between society and foreign correspondents is broken. Some journalists who come in might genuinely believe that what they are seeing and what they are hearing is the truth. They might not be aware or sensitive to the incredible fear and tyranny in Rwanda. It’s one reason for the positive press about Rwanda – essentially repeating the government narrative – that celebrates a country rising from the ashes after the horrors of genocide. But for those familiar with dictatorship, the facade is quite obvious. I remember meeting a Russian UN worker whom I asked, just a few days after his arrival, what he thought about Rwanda. He laughed, and said, “It’s just like the Soviet Union: I opened the newspaper this morning and there’s only good news!” An untrained eye might see a prosperous, happy country in those positive reports. But to someone like him who knows, who is familiar with these contexts, well, the whole thing rings alarm bells. Another woman I met, who had grown up in the former Yugoslavia under Tito, reported similar things. There was something about the tone adopted by the government; she knew she had to be very careful about what she said in Rwanda. To your question about foreign governments and international aid organizations: they are aware of everything that is happening in Rwanda, aware of the repression. They are aware of every single military official, journalist, activist, who has been killed, forced into exile or disappeared. They know about it. And yet they continue in a hypocritical relationship with the Kagame government. Western aid programs are “successful” largely because of the same efficient, repressive system the Rwandan government uses to maintain power. These aid agencies come into the country with all sorts of plans written up and, as soon as they have been approved by the Rwandan government, 95 percent of people follow the plan. This is in stark contrast to most of the rest of the developing world, where you might be lucky to get 30 or 40 percent compliance and participation in aid programs. And so, for many Western governments and aid agencies, Rwanda is a paradise. I have seen so many foreign officials, and foreign aid officials, receive promotions for their effectiveness and the efficiency with which their operations are conducted in Rwanda. The incentives are all in the wrong place. There is no incentive for them to speak up about the repression. In fact, they have come to a point where they can use it for their own ends, their own benefit. It has led to a perverse relationship between Rwanda’s repressive system and international aid organizations. This is nothing new, it should be said. Dictatorships have long been convenient for Western governments. In a dictatorship, they often only have to deal with one person. There’s no need to deal with the parliament, for example. And so foreign interests are served quite easily: there is no parliament to observe or ratify your treaty. Western governments have long had these relationships, whether with Hosni Mubarak in Egypt, or the regime in Saudi Arabia, or Bashar al Assad in Syria. It’s the same thing with Rwanda – there’s very little difference, in fact. What’s been the fallout from the book since it’s been published. I knew from the beginning that writing a book like this would mean severing all my ties with Rwanda. I lived there from 2009 through 2013 – almost five years in total. It’s the longest I’ve lived in any one place in all my adult life, the closest I’ve come to knowing a sense of home. And so I had many close ties, close friendships, with people in Rwanda, and I knew that I would have to forsake those in order to say what I thought needed to be said. But it was a price that I decided was necessary and worth it, because of the frequency with which the government was abusing its power in Rwanda. It was important to write this book, as well, because as a foreigner I can afford to lose those ties. A Rwandan who says the things I say in the book could face death, and will certainly face harassment. The stakes are much higher. The journalists I was working with were incredibly brave – they knew the stakes, they knew the risks in confronting the government. They knew they could lose their lives, and some of them did. But they were hoping for a country that is freer, a country that was less likely to witness more violence in the future, a country where their children could enjoy a sense of freedom. The stakes were higher, but also were the rewards. It’s a completely different situation for them. It was a traumatic experience to come out with the book. It has changed my life. I wouldn’t try to go back to Rwanda. Journalists who have criticized the government have been barred from the country, deported in some instances; some of their children have been threatened, even in the United States and Canada. I don’t expect to be let back in any time soon. The Rwanda government, interestingly, sent one of their officials to a talk I was giving at Chatham House in London. That official asked me very personal questions – who I was living with in Rwanda, what my visa status was at the time, and so on. The minutiae of the questions were clear signals that they had been looking into my file. Otherwise, the government continues to put forward the narrative that it always has: that there is no repression of the press in Rwanda, or if there has been, it is now free. The end of the book includes an appendix listing more than sixty journalists – and the list is hardly exhaustive – who have been killed, arrested, disappeared, tortured, or forced to flee the government in fear for their own lives after criticizing the government. There has been no comment from the Rwandan government on this. The book concludes on a downbeat note. Is it your sense that nothing has changed since you left, that the free press is dead and destroyed in Rwanda? At the end of 2013, there was a government effort to “improve” the condition of the press, on the surface at least. An oversight body was set up so that journalists could regulate each other, but last year, I believe, the head of that body had to flee Rwanda in fear of his life. He had opposed the government’s banning of the BBC, arguing that an important information source for the people that had been banned. This amounted to an implicit criticism of the government. He received death threats, and ultimately fled to Germany. So no, I don’t believe there has been much change; things may be worse now. That said, there are still some very good journalists in the country. But they are largely silent. They have seen what has happened to their colleagues who attempted to do the work of journalism, who attempted to hold the government accountable. And so they do not carry out their profession as they should, for very understandable reasons.